The first row of an afghan with homespun or bouclé or other knobby style yarn can be frustrating. This afghan does not require finding chain stitches, even for the first row. The sides are a straight edge, and the top and bottom has a border with a loop edge. 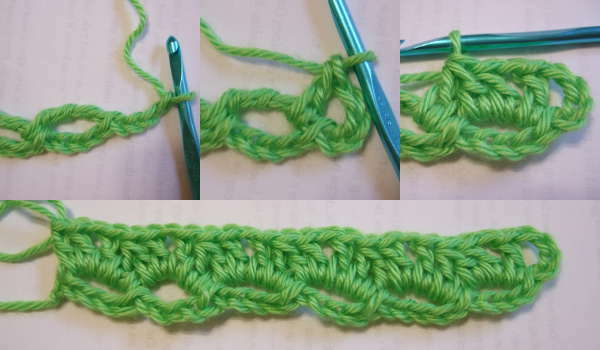 Double treble crochet (dtr): Wrap the yarn over the hook 3 times and insert the hook into the space indicated. *Wrap the yarn over the hook and draw it through 2 loops. * Repeat from * to * 3 times to complete the double treble. Decrease stitch (dec): yo, insert hook in ch sp, yo and pull up a loop, yo and draw through 2 loops on hook, yo, insert hook in next ch sp, yo and pull up a loop, yo and draw through 2 loops on hook, yo and draw through all 3 loops on hook. There is a video tutorial and a chart available. Instead of a beginning chain, the blanket is begun with a first row of chain and dtr spaces. Row 1: Chain 4. Dtr in first chain. This forms the first chain and dtr space. Form each additional space by chaining 4 and doing a dtr on the dtr of the prior space. Make an even number of chain and dtr spaces. Row 2: Ch 4. Without turning the work, rotate so that the following is worked across the dtr created in the first row. Over first dtr work dc, ch1, dc, dec. The dec will move to the next dtr. Over it and each dtr to the last work dc, ch1, dc, dec. The second part of the last dec will be in the last dtr. On the last dtr, also work dc, ch1, 2dc. Row 3: Ch 3 and turn. Sc in ch-1 sp. Working across row, ch 4 and sc in each ch1 sp. At the end of the row, ch 3. Sc in the space created by the ch 4 turning chain. Row 4: Ch4 and turn. In ch-3 sp work 3dc. Working across row ** ch2, skip a ch-4 sp, (3 dc, ch 1, 3 dc) in next ch-4 sp. Repeat from ** across to last ch-4 and ch-3 spaces. Skip ch-4 sp, ch 2. In the last ch-3 sp, work 3 dc, ch-1, dc. Row 5: Ch4 and turn. In first ch-1 space work 3 dc. Working across row ** ch2, (3 dc, ch1, 3 dc) in next ch-1 sp. Repeat from ** across to last ch-4 space, ch 2. In the last ch-4 sp, work 3 dc, ch-1, dc. Row 6: Ch4 and turn. In first ch-1 space work 3 dc. Working across row ** ch 1, reach down to ch-2 space below ch-2 space of last row and make a sc , ch 1, (3 dc, ch1, 3 dc) in next ch-1 sp. Repeat from ** across to last ch-4 space, ch 1, reach down to ch-2 space below ch-2 space of last row and make a sc , ch 1. In the last ch-4 sp, work 3 dc, ch-1, dc. Row 7: Ch4 and turn. In first ch-1 space work 3 dc. Working across row ** ch2, skip (ch1, sc, ch1), (3 dc, ch1, 3 dc) in next ch-1 sp. Repeat from ** across to last ch-4 space, ch 2, skip (ch1, sc, ch1). In the last ch-4 sp, work 3 dc, ch-1, dc. Third to last row: Ch 6 and turn. Skip first ch-1 space. Working across row ** skip (ch1, sc, ch1), sc next ch-1 sp, ch 6. Repeat from ** across to last ch-1 space, ch 6, skip (ch1, sc, ch1). Sc in the last ch-4 sp. Second to last row: Ch 4 and turn. In each ch-6 space across row up to the last ch-6 sp, work (3 dc, ch 1, 3 dc, ch 1). In last ch-6 sp, work (3 dc, ch 1, 4 dc). Last row: Ch 4 and turn. Sc in ch-1 sp. Working across row to the ch-4 sp at end of the row – ch 4 and sc in each ch-1 sp. Sc in ch-4 sp at end of row. Finish off and weave in end. 3/17/14 – corrected last number of chains in third to last row. 1/11/17 – added link for video tutorial. Absolute beautiful. Can’t wait to make one. Love it! Thank you so much for your pattern. Just wondering, is a dtc the same as a dcr? I’ve seen dcr used for decrease and double crochet. The dtc is a double triple crochet or double treble crochet. I have an explanation of how to make one in the special stitches section of the pattern. No a DTC is double triple crochet. Hope this helps you. I am so excited to see this pattern. I have this same afghan that my grandmother made for me, but could not decifer the pattern. Thank you for letting me make another to continue the tradition. I’m confused – are DTC and DTR the same stitch? Yes, but I had not realized I had mixed abbreviations. Sorry about that. The correct abbreviation is DTR, so I have changed that now in the pattern. Thanks for pointing that out. 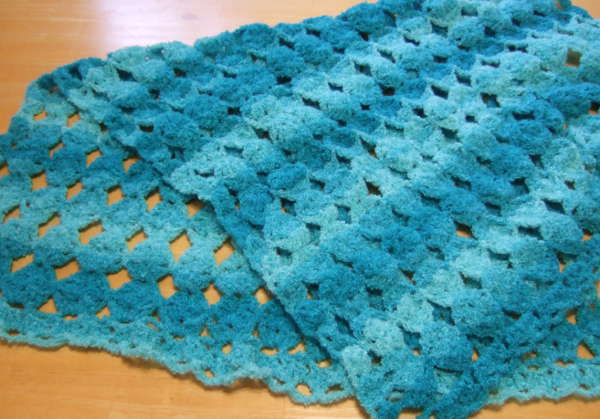 This looks like a wonderful blanket for a baby… and simple to use! DTR is so easy, you guys will get it easy, and i’m used to seeing double-triple as DTC, but I will adjust. lol it’s all good! Thank you for taking the time to teach us this pattern! Can you email me directly, where is the repeat made to keep going on this?? The repeat of rows? That would be 5 through 7.
it looks easy for me im going try it. I’ve been wanting to change and this looks easy enough to change it to. Thanks. Mama, a great big hug for you!! I LOVE this no-chain foundation row. I am a big fan of no-chain foundation methods and use them whenever possible. 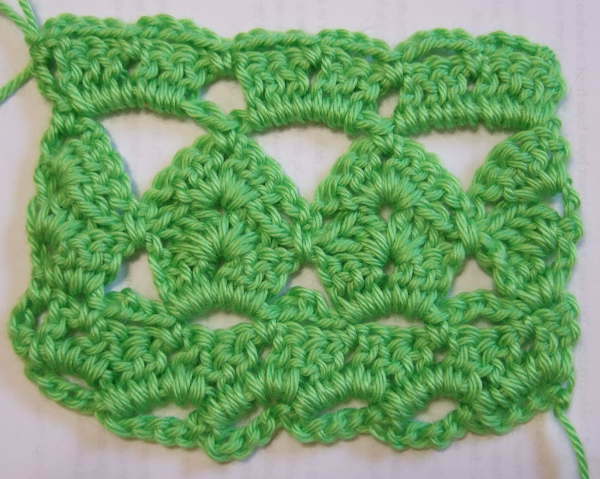 This one so quick and easy and creates a lovely lacey border. Thank you, thank you. I think this would look beautiful as a shawl. I’m always looking for new designs to make prayer shawls. Thanks for the pattern. If Charlotte K turns this into a prayer shawl, could you please let us know the pattern. Would love to make a prayer shawl in this pattern. I’d like to make one that is 21″-24″ wide by 68″ long. How many starting ovals would be needed? Thank You. Start with 20 chain spaces. Love your patterns. Have used several so far. Easy to understand,easy to make & the pics are such a help. Thank you. I love the idea that you can make this as wide as you want without calculating the number of repeats in the pattern to get the foundation chain right. Looks easy and quick. Can’t wait to try this out! I love this pattern, I’m finding that I don’t have the patience for making afghans or blankets anymore so I have been making mostly small stuff but I think this would be quick and easy and I might even finish it! Besides it doesn’t look like it would be so heavy as some I have made in the past. Thank you for this pattern. What a wonderful pattern. This would certainly make a gorgeous afghan but I may try to make it into an infinity scarf (and give you credit for the pattern, of course). Thanks for the free pattern on my birthday. Thank you for sharing this pattern. It is beautiful and I will be making one for my new grandchild. It does look easy and I get tired of making chains and counting them and still comming up wwrong. Thanks again, God Bless Y=you. I can’t wait to make this. I alway’s like to try something new. I seem to have a poblem printing out these patterns. Can you tell me an easy way to print them out? There is a printer icon at the top of each pattern. If you push that, it will give you a clean copy of the pattern for printing. thank you for the pattern, it looks so easy. I am sure they will love your pattern. Love this pattern. I’m gonna make it for my dear mother-in-law. ShE will just LOVE it! Thanks for sharing. this is beautiful i will surely make this soon – am working on a Spiderman blanket for my grandson now. My first Great Grandson is soooo in LOVE with Spiderman. IF you can direct me the place you found the pattern I sure would appreciate it. PLUS knowing Pierce would be in Seven Heaven to have ANYTHING Spiderman added to what he already has. Just finished my blanket. I love the way it came out, thanks for the pattern use. It’s fun to see a new approach to crocheting afghans. I plan to give this one a try for making a lapghan. The chart on yarn amounts by size is especially helpful. Really nice! Will be making this one. Thank you! I want to make this changing colors (pastels for Easter) but doing the repeat of rows 5-7 doesn’t look right as it doesn’t give the afghan a clean look of one row of eggs in one color and the next another. Also the row where you have to reach down to do a single crochet over the chain 2 space ends up coming out on alternate sides of the blanket as I continue to work it. To make color changes between eggs, make the changes between row 6 and 7. You are right about the single crochet being on alternate sides since it is a three row repeat. I don’t get the part about changing colors…could you explain further? I don’t know what part you need further explanation on, so I will try and you can let me know if I didn’t touch on what you wanted. The gist of my color changing advice is that the last loop that you pull through on a row is actually the first loop of the next row, so if you want to change colors, you actually want to change the color before pulling through that last loop of the row. Otherwise you will have a loop in the next row of the color from the previous row and it will stand out. I am excited to try this one. So I printed it out. The only thing I don’t like is when you print it out you get all the comments with it. I can read those on line. I don’t want a print out of those. It is a waste of paper and ink. Is there a way of printing just pattern and instructions? Yes. There is a printer icon at the top of the pattern. Using that will produce a clean version of the pattern without the comments. i just finished making this lovely blanket! the lady i made it for loves it and i cant wait to use more of your patterns!!! I wanted to let you know that your patterns are beautiful. I just love all that you are sharing. In row one you make loops. To make the largest sized blanket, make 60 of these loops for that row. where can purchase Sensations Rainbow Boucle yarn cannot locate this. Sensations is exclusive to Joann and unfortunately they just recently discontinued the Rainbow Boucle. I have new information. There is a new brand at JoAnn called Purl Essence that makes the Rainbow Boucle. They are different colors than the Sensations ones, but the same type of yarn. I am fairly new to crocheting, but I wanted to give this a try. However, I am stuck on row 3! I am using the Country Loom yarn and it is very “fuzzy”. I am having trouble finding where ch. 1 is in the previous row. Any tips? After a few rows it will probably get easier. You may be able to just aim for the center of the shell and find the right place. If there is some doubt, you can feel of the shell to find the spot with three dc on either side. How many ch-4 loops do you have after row 3? You should have 27 ch-4 loops and a ch-3 on the two ends. I’ll be trying this. I have about four projects going now, every day I get an email with a new idea! Here is an article with links to several beginner patterns. Thank you much!!! I bought some thick and quick homespun yarn and have been having a dickens of a time trying to start ANYTHING with it. The no chain foundation is perfect to get me going. I have not tried this easy no chain pattern, but I want to thank you for the easy download. I will give it a try while I am on vacation. I love this pattern. I am working one with pastels for Easter, probably won’t be quite done by Sunday, but the kids won’t be here for another week anyway, so I think I have time to finish it before they get here. Anyway, I am just wondering how many rows of “eggs” I should make on an extra large afghan? Thanks for such a great pattern. That would be about 40 egg rows. Love this afghan, just found it today and can’t wait to start it. Thank you so much for the easy download and I wan t to get more of your afghan patterns. Love all of them. I only crochet though. No Knitting. I have enjoyed seeing the beautiful crochet. Can you help me with row seven? Ch2, skip (ch1,sc,ch1) (3dc, ch1, 3dc) in the next ch1 sp. What does the “skip” mean. Skip those stitches (the ch-1, sc, and ch-1 that are between the shells) meaning don’t work any stitches in them. Work the shell (the 3 dc, ch 1, 3 dc) in the ch-1 of the shell. Thank you for your question on this because I was having a horrible time until I saw someone else was as baffled. Thank you after reading that and the answer I finally am on my way. Woohoo. I’m happy now. Hi. I’m fairly new at this crochet thing, and really enjoying it. I’m wondering if you have a way to help me keep the 1st or last loop on the hook the same size as the middle loops. Mine always seem to be so much larger than the rest. Please help. I’ve started and restarted this rug 4 times now. Not that the pattern is the problem, I love the pattern. The problem is the person managing the hook. Love this!!! How very creative! I especially appreciate the weight/yardage chart…I can see variations of this method dancing in my mind’s eye…..Thank you. On row 7 ch2 skip ch1 sc ch1 what or where do you put thr ch2 and the sc goes in the middle ch1 then the top of next shell please help this is whetr Imstuck! For row 7, you work shells in each of the shells of the preceding row with 2 chains between them. It is just like row 5. I have been looking for place mat pattern and this looks perfect. Lovely pattern. Can’t wait to start the project. The blue blanket at the top looks different from the green one. Did you perhaps felt it? I want to make one that looks more like the blue one. Could you help me out? It’s a yarn difference. My No Beginning Chain blankets are designed to be friendly for highly textured yarns, so I show all my finished blankets with those types of yarns. But highly textured yarns obscure stitch detail, so for purposes of demonstration, I use a smooth yarn. My finished blanket at the top is made with Jo-Ann Sensations Rainbow Boucle. That line has been discontinued, but they have added a new line called Purl Essence Rainbow Boucle that appears to be the same style of yarn, but has a different color scheme than the Sensations version. GREAT PATTERN. I used to crochet when I was a kid (50+ years ago???) and a favorite aunt introduced me to the art. I have recently become interested again and have been looking for simple projects to try. I recently bought some recliners and found that the manufacturers no longer provide head-rest or arm protectors. I thought WOO-HOO, a project. This pattern worked VERY WELL. I had 18 chains for the head-rest and 10 for the arms. It worked beautifully. It worked up very quickly and was a lot of fun. I’d like to try this lovely pattern, but I need help. What does dec mean? Dec first appears in the Row 2 directions. I’m a beginner crocheter, and I think it might mean decrease, but I’m not sure. Please let me know. It’s in the special stitches section of the pattern. OMG! I got it, by george, I got it! My poor, sleep deprived, menopausal, hotflash fried brain finally got it! I found your site in the wee, small hours of the morning and was so excited over the prospect of another type of chainless foundation. But when I’d look at the pictures and then read the text….well, it’s like my brain was saying ” Does not compute, system overload, brain will start shutting down NOW, brain off, thank you and please come again….. “. Every time I’d look at the pictures, all I could see were those garlands we made out of strips of construction paper back in kindergarten! I was so frustrated! But I came back to it this afternoon after I had a nap (is it still considered a nap when you simply pass out from exhaustion?) and it all made sense! Sleep is a wonderful thing! I can’t wait to show my cousin. She will be pumped! I deeply appreciate the time you spent photographing the steps and writing out all of the instructions. I’ve tried to write out the directions for a few patterns I’ve created and I just gotta tell you…..I do not enjoy it (BIG understatement). So, thank you. I’m going to enjoy looking through the rest of your site! The extra small size is a good baby size. It takes 827 yards. Great pattern!! I’ve been working on this today! It’s fast and fun! Thank you! This is the only pattern I’ve been able to find for the Sensations rainbow boucle! I have 4 of the black & pink but yours is SO much prettier in the blue! Thanks for sharing your beautiful no chain patterns. The pattern looks lovely. What stitch do i use for the dec in row 2 please? I haven’t done this one yet but will add it to my list. We only have one more week of school and then I should have some time to knock out some of these videos. Love this pattern. Wish there was a video for dummies. I really want to make this one. I found this pattern through the All Free Afgans site a couple of days ago & I’ve just finished it this evening. Brilliantly easy and fast too. I used your stitch count, but used two balls of Aran wool simultaneously (in olive green and denim blue) and my 8mm hook! This has resulted in a very chunky, very warm and cuddly afghan…just in time for the colder weather! Would have posted a picture for you here, but can’t see a way to do this. Thank you very much for this, and all your patterns. Your afghans are all so beautiful but being dyslexic it makes it hard to follow the written patterns. Do you offer any of your patterns using a visual pattern with standard symbols? I have an easier time following those. I have charts for some of my patterns, but will make charts for any of the others upon request. Just let me know if there are others you’d like to have a chart for. I LOVE your No chain Egg Blanket. I would need to see a video to answer some of my questions. I can’t find one on You Tube. Thanks for sharing your beautiful work! I don’t have a setup for making videos at the moment so haven’t been able to make any in a while. I can try to answer you questions. It’ s very helpful to have the chart as well as the written instructions. Thanks for going the extra mile to make things easier. I’m having trouble getting started. I don’t quite understand the beginning of the instructions. I would really like to crochet this afghan!! This is just what I was looking for! I was starting a prayer shawl to donate to the seniors home and kept getting the amount of chains needed wrong. I was going to search to see if there was a way to start a project without a beginning chain. I opened my email this morning and found your project. You made my day! Thanks for sharing it!